Best Inversion Tables 2019 – The Winners! Here are our quick recommendations for the inversion tables for beginners and experts. These results are curated after various tests on these inversion tables by our experts and the results are determined by various factors such as price, durability, stretching angle etc. Here is the best inversion tables list as reviewed by Fitnesstep1’s – let’s go for an inversion. 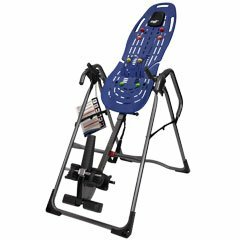 Teeter EP-960 Ltd Inversion table is one of the best out there, It’s from a brand which has pioneered the inversion tables since the 90s, It has a very sturdy build and has been Quality tested to UL safety standards positions, the entire product weighs 65.5 pounds which can handle weight till 300lbs. Users hugely rely on the inversion table’s safety features to avoid serious injury thus the EZ-Angle Tether marks pre-set angles of inversion at 20, 40 and 60 degrees, one can also adjust angles according to their comfort. It simply does what it says. Users look for comfort and good grip when getting over the apparatus which is where the EZ-Reach Ankle System pops in, It provides more comfort by allowing a triple-lock security and extended the handle to reduce the need for bending while securing the ankles. Another feature is the Over-EZ Handles, One can stretch even more by the large handles which provide assistance, support, and even more stretching options. Lastly, the bed you lie on has to be really sturdy and comfortable, Teeter Ep-960 has a FlexTech Bed, it’s Teeter’s Patented Flex Technology that moves with you for greater range of motion and stretching options. It’s smooth and low-friction surface optimizes decompression. Removable head pillow attaches right on the Bed with customizable placement. You also get the 5-year warranty and an exercise DVD. You need to buy this for the wide range of flexible feature this product has, it has consistently outperformed the competition in comparison testing for endurance, rotation control, and ease of assembly. Many new inversion tables are getting over the old strap systems that were a small hassle to the entire process, Innova’s ITM4800 model gets rid of that. This ITM4800 inversion table is made up of heavy duty steel tubing and boasts a weight capacity of 300 Lbs. Innova ITM4800 has a unique 4-position side inversion pin that replaces the old style strap and easily adjusts, making varying degrees of inversion simple and safer. One has to just position the pin in the desired decline position and know that your inversion position will be comfortable and consistent each and every time. The Inversion table comes with adjustable lumbar support and has large energy foam comfort backrest and padded removable head pillow, with soft touch foam handles that make the entire process very soothing. The best part is that this model has multiple mode massage settings with auto and manual selections, the lumbar pad can also adjust for isolated heat and massage therapy. Combining a relaxing soft vibration massage with heat makes this Inversion table one of the most therapeutic and advanced tables on the market to date. It has the therapeutic effect on the user. The entire frame is designed to fold and easy storage. With its low price point, this is my best bet if you want pure value for money, with its wide range of advanced new features, you get a complete therapeutic experience. A must buy if you’re looking for an advanced Inversion table with massage qualities. Best for people who have just hopped in the field of inversion tables. The Gravity 4000 is made up of a durable tubular steel frame with a scratch resistant powder coated finish. It has got Memory Foam vinyl covered backrest with double stitching, tough rubber non-skid floor stabilizers to prevent any movement during inversion and three adjustments for different starting inversion angles. It has the highest weight capacity of any inversion table and withstands weight till 350 pounds. This model has a tough rubber non-skid floor stabilizers which provide stability allowing the inversion table to inverts up to 180 degrees. IRONMAN Gravity 4000 has got a safety tether strap which controls the angle of inversion, also the safety vinyl side covers and lumbar for lower back support provide ease of motion while inverting on the table. This model has a new Ankle Locking System, it’s a patented Easy reach ‘Palm Activated’ adjusting ratchet ankle locking system which is a boon for users and ensures added safety and comfort. This model has ergonomically molded ankle cushions which hold ankles securely and comfortably. When not in use, the Gravity 4000 can also be folded for better portability. For the maximum weight capacity of any inversion table and the new patented Ankle Locking system, this is worth giving a try. This sleek looking apparatus is built out of a heavy-duty steel frame, It is adjustable for the user height range from 4’10” – 6′ 6″ and has a weight capacity up to 300lbs. Inversion Table Pro has a 3 position roller hinge which makes inversion a very easy process, though for the first time I’ll still recommend having someone stand near you in case you are stuck in the apparatus. The inversion table has comfortably padded ankle clamps which provide control for rotation, they also hold user in one place, the best part is the Nylon support pads which can be removed for cleaning, they act as an added support while inverting. The table folds for easy storage after use and weighs 48 lbs which is very light, for a price of around hundred bucks – this table gives you everything required for a rich inverting experience. A table build out of steel frame is always sturdy and durable, similarly, the Exerpeutic Inversion Table is also built with an exceedingly 1.5-inch square steel frame and a scratch resistant powder coated finish. It has a foam vinyl covered backrest for a comfortable head and back when inverting and like many inversion tables, even this has a user weight capacity of 300lbs. 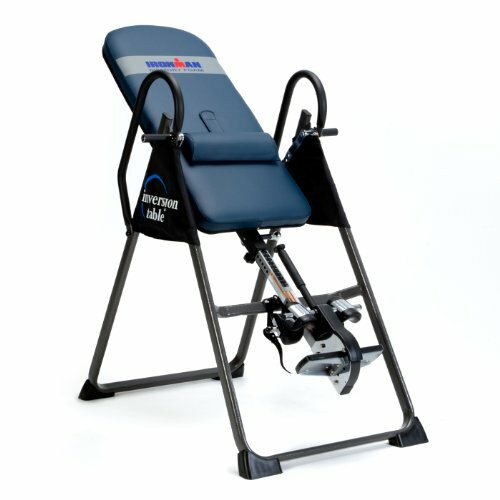 This inversion table has a soft, foam padded backrest and foam rollers and ankle cushions to hold the ankles securely. With extra-long, full loop safety handlebars it is easy to return yourself to an upright position as first-time users can easily get stuck at an angle, the adjustable tether strap allows you to adjust and maintain the inversion angle of your choice, it can easily invert up to 180 degrees. This model has Extra-long, full loop safety handlebars and adjustable tether strap for safe and easy inversion adjustment and returns to upright. The entire backrest of the table is made up of soft foam which is great for people who feel uncomfortable on non-padded foam backrest. This is the great choice for people who want a soft fully padded backrest and a sturdy design of the Inversion table. Humans have well evolved from the times when our forefather, the apes would hang from trees to handling extreme tasks with ease, the humans as we know today are way behind the great apes. Long office hours, long driving hours and less exercise are causing many cases of back pain and stress issues, I’ve myself been through few of these and have since hopped over several things as a solution until I found about Inversion therapy. Being a tech fanatic and a fitness freak, I researched over tons of material over inversion table and inversion therapy for a few weeks extending up to a few months and I was honestly surprised to find out that inversion therapy was already used as early as 400 BC where the father of medicine, Hippocrates, inverted patients using a ladder to realign their spine believing this will cure their illness. I was convinced and made a decision to get myself an inversion table and I’ve had amazing experience since then, it’s a great way to destress and has just done a lot more to me than relieving back pain. They are quickly becoming popular, a way not efficient for us to hang on trees but surely something that shall give us a few more years to walk. So what is an inversion table, in simple terms it’s a flat adjustable table where you lie down and slowly invert your position until you are entirely upside down, It eases your muscles and relaxes the spine allowing a good blood circulation and rick flow of oxygen to the brain. I would often practice it while doing deep breathing have had rave results almost immediately. Here is how it actually works for your body, the vertebra or several bones of your entire spine are separated by disks which help in movement and shock absorption. High-stress exercise, vigorous bumpy travels, and repeated strain causes compression of those disks which leads to the protruding of a semi-fluid material that puts pressure on the nerves, a condition often popular as slipped disks. So when you practice inversion therapy on an inversion table, the body hangs upside down, it relaxes the vertebra reducing any pressure on disks that causes the nerve to exit the spine through these spaces, Increase in these spaces, in turn, reduce any compression on the nerve helping to relieve the back pain. If the body is oscillated or moved up and down on an inversion table, it also causes pumping action which helps the fluids around the spinal discs to expel the waste out and help in spreading the fluid around the discs erasing away any back pain. In 2007, a study conducted by the Newcastle University in the United Kingdom held over an experimental group of sciatica sufferers proved that inversion table could reduce the need for surgery by 78%. It decompresses your spine and elongates it thus also improving your posture. It stretches your body from head to toe. It promotes spinal alignment, stretches and elongates the spine, relieves the pain and takes away any pressure on disk. 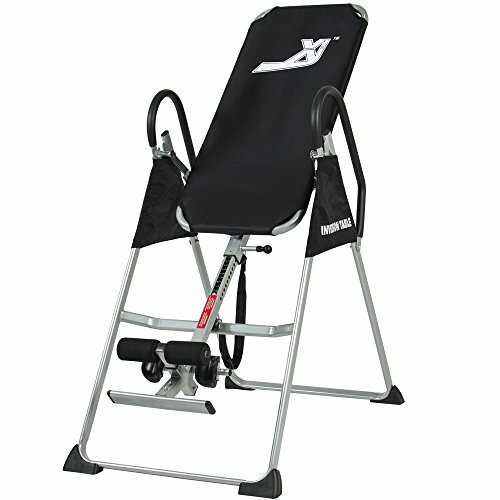 The construction plays a very important role when choosing an inversion table as the apparatus is everything, a poor build quality can indulge in some serious injuries while inverting, a solid build of steel is always preferred padded with good quality foam for added safety, one should look for industry standards while choosing in terms of design and construction. Also to be kept in mind is the weight capacity which is 300 lbs for most inversion tables. Initially, most users invert till 45 degrees while one can easily go till 90 degrees for better results. More your angle of inversion, the better results you yield. For the first time user should always have someone around in case you’re stuck, it’s important to look at the safety features of the table such as padded foam and good quality straps. While filtering out results we made sure to select products that delight users when they choose to buy their inversion table. From soft padded foams to nylon straps and heat insulated structures, the additional features incorporate more than just providing you inversion. Anti-slippery pads to lumbar supports, it’s all there. We also have a few providing adjustable massaging quality. This can be the most important deciding factor for a lot of users, we’ve made sure to keep a balance of results such that you’ll find all of them perform the same function with the price increasing only when some added benefit is being provided by the company. With time, we won’t become as powerful as the apes but we are experiencing pressure physically and mentally that definitely takes a toll on our health, things like inversion tables are surely going to be a big boon to distress and their popularity is set to only increase with time. With so many options in the market, the above choices are the best in terms of the important factors like Value for money, Comfort, and safety. I’m sure you’ll have a great time inverting and wish for your great health. We hope this review will help you to choose the best inversion table to match your requirements. Heard of inversion therapy? If you want to try inversion therapy, you must have an inversion table. Choosing the right inversion table can be difficult task as there are hundreds of different brands selling inversion tables and its hard to settle for any random table like that. 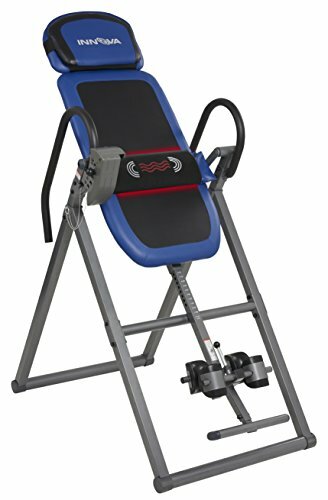 Our fitness experts have done an extensive research on the best inversion tables available in the market and we have recommended some of the top models of inversion table for you. Previous ArticleKeiser Spin Bike Review – Indoor Cycling & Cardio EquipmentsNext ArticleCan I Use Genetic Information to Improve My Training and Nutrition Plan? Is pain and discomfort normal during inversion? How should I deal with it? Pain and discomfort is not normal at all during inversion. In most cases, experiencing pain during inversion is as a result of doing too much too soon. You may also experience mild discomfort immediately after doing longer inversion sessions. During the inversion, when you experience any pain at that moment, it is best to stop the exercise and relax for a while. After experiencing the pain, the next time you use the machine, you should definitely go for a smaller tilt first and get used to it first before progressing and increasing the angle. Some of the tips you can consistently use to improve ankle discomfort are; having proper footwear like socks and laced up shoes to provide cushion and support for the ankles and ensuring that you have a proper fit, which can be done by adjusting the ankle lock system snug enough to make you secure. If the pain after doing the inversion becomes severe or persists it is best to see a doctor regarding that. The angle you should invert varies greatly depending on how long you’ve been inverting. For beginners, a mild angle of 20-30 degrees is the best place to start. You can stay at that angle until your body begins to become comfortable with the table’s operation and until your body can completely stay relaxed when inverted. At this angle, you experience mild stretching of your joints and muscles, there is improved oxygen flow and your internal organs begin to get repositioned. For an average person, 60 degrees is ideal for you. This is where most people are at and you don’t have to go past this angle because you get many benefits that your body needs to this degree. For top athletes and people who are really comfortable with full inversion, 90 degree is what they go for. Normally the intention is to enjoy the extra traction gotten from full inversion. What exercises should I do while inverted? While you are inverted, there are very many recommended exercises you can do to help your body more. You can do inverted crunches where you place your hands behind your head and then lift your torso halfway all the way to your knees. Full sit-ups are also recommended because it is the safest way for your back since the spine is in line with gravity. The sit ups in this position are extremely difficult but are very effective. You can do inverted squats-this exercise makes you exercise your legs too. It is the same as a standing squat only that for this, you are technically utilizing your leg muscle to pull all your body weight up. In addition to those, you can also do back extensions and added traction for work out. What are the benefits of using inversion tables? Many people have attested to the fact that invasion therapy using invasion tables has greatly made a positive impact in their lives. It has many incredible benefits which are; it helps with blood circulation to your head, improves flexibility, and helps with back pains, muscle pain, and motion sickness. For some people, inverting on a regular basis has helped them reduce the frequency of migraines and has helped in relaxing and relieving stress. Is inversion therapy for everyone? Despite the many benefits that inversion therapy has on general health, it is not for everyone and can even cause harm to some people. There are some health conditions that are very sensitive and require you to see a licensed doctor or physician to get approval before trying out inversion. Inversion therapy is generally not recommended to pregnant women, people with bone weakness, people with heart and circulatory disorders, glaucoma, hypertension, obesity and people with spinal injuries. What are the limits for inversion tables? Most inversion tables have no height limit and can be adjusted to fit someone not taller than 6 feet and 6 inches. For the weight, however, the limits vary depending on the inversion table you buy though most of them can hold people who weigh over 300 pounds. Does the age you start inverting matter? Can it help with scoliosis in children? For the patients with scoliosis, it is recommended that they begin at a very early age. Inversion at this point helps slow down and reverse the effects of scoliosis especially before bones start to fully harden which is technically at age 13-14. Most scoliosis in children is mainly related to calcification disorders or bone anomalies which do well with inversion. The only setback here is that the size of the equipment for children is most times an issue so an attendant is normally required. 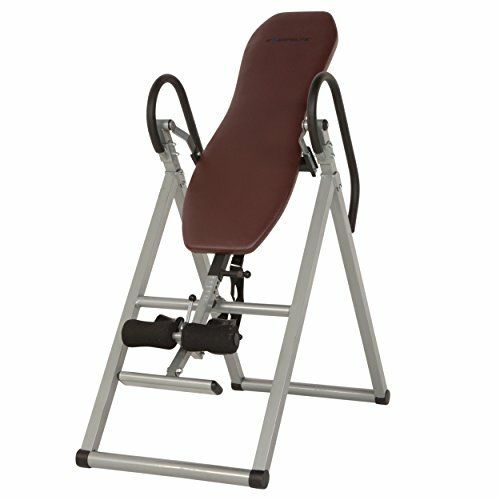 How can I find the balance point for the inversion table? This is a relatively easy process which depends mainly on your height and weight. You should start by adjusting the height selector bar to your height since the default settings for height are very general. Your upper and lower body weight ratio will definitely warrant some adjustments to ultimately find the proper balance. Next, you should secure your feet, lay back on the bed and raise your hand over your head to check if the bed will move backward. If it goes back quickly, lower your body position much closer to the floor. This is done by adjusting the height selector. If you don’t move backward, change the height selector so your body is further up. In addition, you may certainly need the handle bars to assist your body in moving either forward or backward by pushing back or pulling up the handlebars depending entirely on weight and body height ratio. Where can I purchase an inversion table? Inversion tables have become increasingly popular recently because of the many benefits that they have. They are available for purchase in major retail stores such as Target. You can also get the inversion table from online retailers such as Amazon and E-bay. When you buy from online retailers, you have the added advantage of going through all the reviews written by the users. This will help you make a decision on what exactly you want to buy and you will know what to expect in terms of pros and cons of the inversion table. Buying directly from the manufacturer is also good because when they sell the table to you it will come with the correct protective packaging and you can confirm if all the parts are available there and then.